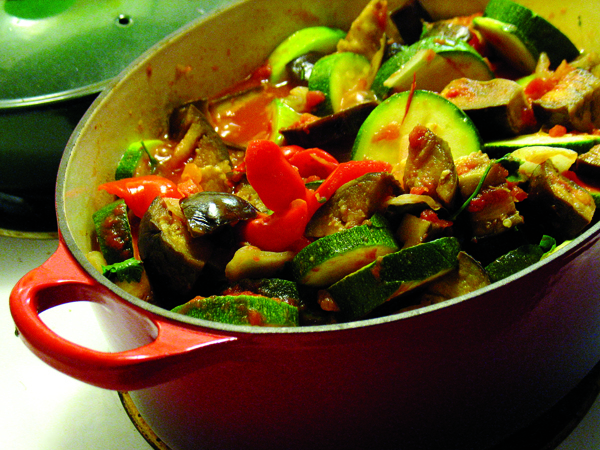 Ratatouille is the perfect catchall for spring and summer’s bounty. A staple dish in Provençe, Ratatouille is loved for its versatility, as different chefs have completely different recipes for the dish. Feel free to play around with the proportions of vegetables, depending on what you like and what’s available. You can eat ratatouille cold, hot or at room temperature, and alone, over pasta or grains, or with bread for dipping. You can serve ratatouille as a subtle side dish or as a Cannes red carpet main. You can even freeze the leftovers. Mon Dieu! In a large soup pot, heat the oil over medium low. Sauté the onions until soft, about five minutes. Add the garlic and sauté another minute or two, until soft. Add eggplant and tomatoes. Cover and simmer on low for about 15-20 minutes. When eggplant is softish, add remaining veggies, bay leaf and fennel seeds, if using. Add ¼ cup of vegetable broth if the mixture seems dry. Cover and cook on low for about an hour or until all veggies are soft. While cooking, be sure check the moisture level occasionally. Add broth in ¼ cup increments if mixture seems too dry, or if you prefer a runnier ratatouille. Turn off heat. Add fresh herbs. Cover pot and let sit for 15 minutes before serving.